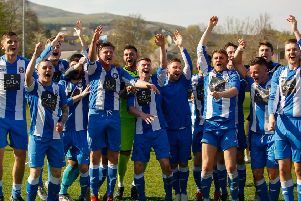 Newtongrange Star produced one of their best performances of the season as they dismantled Whitburn Juniors 8-0 to seal their place in the quarter-finals of the East of Scotland Cup. The Star were down to the bare bones and had to recall striker Stephen Scott from his loan spell at Haddington but the East Superleague side showed little sign of weakness last Saturday as they were five up within 38 minutes. Striker George Hunter completed his hat-trick in the second half before going on to net his fourth and Star’s eighth with little more than ten minutes remaining in a sparkling performance against their struggling Premier League opponents. The avalanche of goals began after ten minutes when Whitburn keeper Penman could only parry K, Scott’s effort out and Porteous reacted quickest to slide in and knock the ball into the net. Hunter got his first of the day when he clipped the ball home at the near post to make it 2-0 after 15 minutes and then his second and Star’s third came when he neatly turned Hamilton in the box before dispatching the ball past Penman. Three soon became four on 29 minutes. Hunter sprung the offside trap and despite being on a hat trick he unselfishly squared the ball to S.Scott who made a scoring return. It was 5-0 after 38 minutes when Penman inexplicably spilled Hunter’s cross into the path of Wilson who made no mistake. There was still time for Hunter to miss a gilt-edged chance after 44 minutes when a Porteous thunderbolt cannoned off the underside of the bar, but Hunter somehow headed over from a yard out. Star, who were reduced to ten men at the start of the second half after O’Hara went off with a pulled hamstring and had no subs available, made it six after 65 minutes. Bracks restored Star to 11 after arriving late to the game just in time to see McNaughton bundle the ball into the net at the back post. Hunter completed his hat-trick when he ran through unchallenged and rounded the keeper before converting and he rounded off the scoring minutes later with a deadly strike in the box.